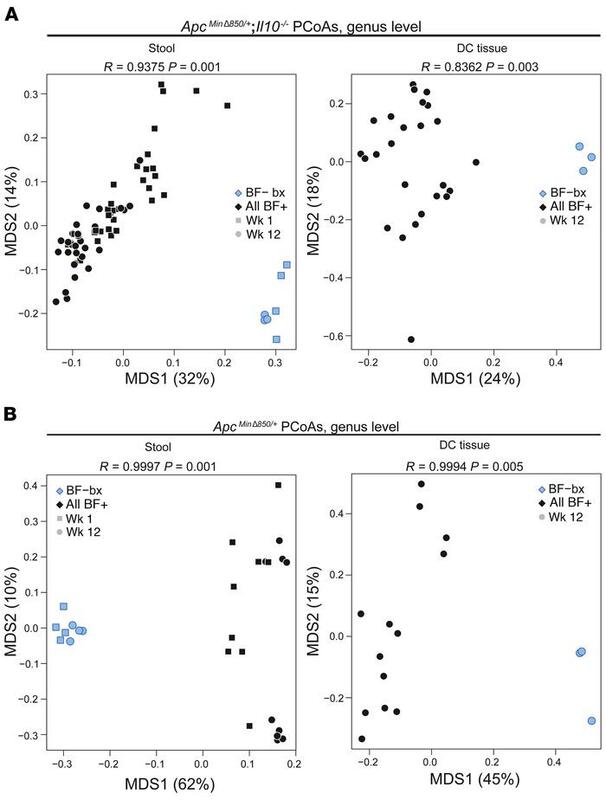 Human colon tissue biofilm status is associated with distinct microbiota changes in GF ApcMinΔ850/+;Il10–/– and ApcMinΔ850/+ mouse models after gavage. (A and B) Genus level PCoAs of ApcMinΔ850/+;Il10–/– stool and distal colon tissue microbiota (A) and ApcMinΔ850/+mouse stool and distal colon tissue microbiota (B). The 3 BF+ groups (BF+bx, BF+NF, and BF+T) are combined into 1 group denoted BF+. Numbers in parentheses indicate the percentage of variation explained by that axis. The different symbols represent the 1-week (squares) and 12-week (circles) time points for the stool samples.